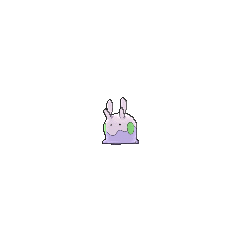 Goomy in game: 2,089 Who? Important notice! Pokemon Goomy is a fictional character of humans. 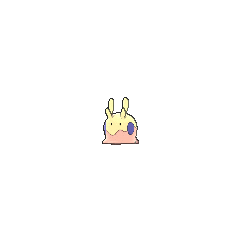 Goomy (Japanese: ??? Numera) is a Dragon-type Pokémon introduced in Generation VI. It evolves into Sliggoo starting at level 40, which evolves into Goodra starting at level 50 when leveled up during rain in the overworld. 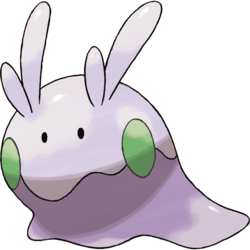 Goomy looks like a light purple, vaguely slug-like pile of goo. The top half of its body is a lighter purple than its bottom half, and the two halves are separated by a squiggly, dark purple outline decorated with five green dots. It has beady eyes, and it has two rows of two horn-like structures on top of its head. Goomy is widely considered the weakest Dragon-type Pokémon. It hides in damp and shady places, such as swamps, to prevent its slimy body from drying out. As seen in the anime, its diet consists of leaves. Goomy made its debut in A Slippery Encounter!. It was later caught by Ash. In An Oasis of Hope!, Goomy evolved into Sliggoo, and in Good Friends, Great Training!, Sliggoo evolved again into Goodra. 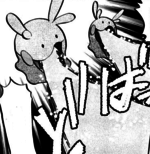 A Goomy appeared in A Fashionable Battle!. Two Goomy appeared during a flashback in The Legend of X, Y, and Z!. XY055 Goomy Ash's Pokédex Goomy, the Soft Tissue Pokémon, and the weakest of all Dragon-types. In order to keep its body moist, Goomy lives in places where it's dark and damp. A Goomy appeared with its Trainer in Santalune City in Kangaskhan...Kangascan't. In PAXY23, two Team Flare Grunts used two Goomy to try and prevent X and Emma from entering the Team Flare Secret HQ. They were easily sent flying with the psychic powers of Emma's Mimi. The weakest Dragon-type Pokémon, it lives in damp, shady places, so its body doesn't dry out. It's covered in a slimy membrane that makes any punches or kicks slide off it harmlessly. The weakest of all Dragon-type Pokémon, it's unable to breathe if its skin dries out, so it sticks to shady places. Moves marked with a superscript game abbreviation can only be bred onto Goomy in that game. For other sprites and images, please see Goomy images on the Bulbagarden Archives. 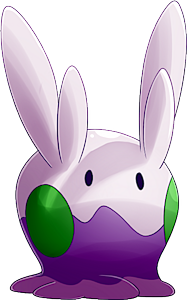 Goomy is both the lightest and shortest Dragon-type Pokémon. 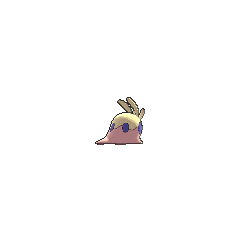 Goomy greatly resembles the prehistoric wiwaxia. Goomy seems to be based on soft bodied gastropods, such as slugs and nudibranch; its typing and eventual dragon design in evolution may be a reference to the "blue dragon" sea slug. It may also be based upon the concept of living slime in popular culture. Goomy may be a combination of goo and either gummy or slimy. Numera is derived from ?? numeru (to be slippery) and ???? nuranura (onomatopoetic word for slimy).